Weekend mornings tend to be when you have a little extra time to spend on making something special for breakfast and yogurt parfaits such as this one are one of my favorite weekend treats. I love Greek yogurt anyways, but by layering it with fresh diced fruit, some crunchy granola, and a little sugar free jam, I can quickly make a very special breakfast treat. This yogurt parfait would be a great holiday brunch idea served along with a basket of fresh from the oven muffins or scones. Fage is my fat free Greek yogurt of choice as I love both the texture and taste, but feel free to use whatever brand you prefer. 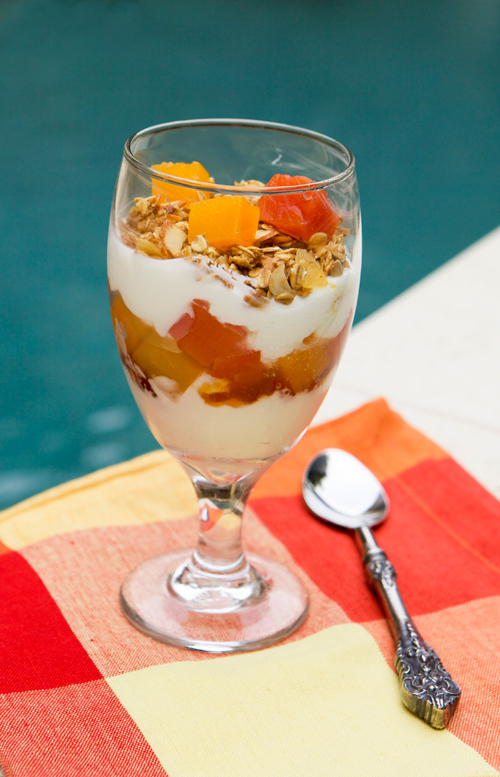 Although I made this parfait with my Tropical Fruit Granola, which inspired me to layer it with fresh diced mango, pineapple and papaya, you could use any granola and fruit combination you prefer. Fat free yogurt is a great source of calcium and protein. 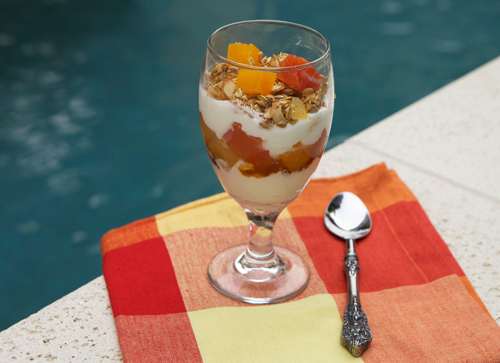 A yogurt parfait can be assembled quickly, is delicious and satisfying. In individual glasses, layer first some Greek yogurt, then a couple of spoons of the jam, then the diced fruit. Add another layer of yogurt, then top with about 1/3 cup of the granola.